Background Hamstring injury is the single most common injury in professional football. MRI is commonly used to confirm the diagnosis and provide a prognosis of lay-off time. Objective To evaluate the use of MRI as a prognostic tool for lay-off after hamstring injuries in professional football players and to study the association between MRI findings and injury circumstances. Methods Prospective cohort study where 23 European professional teams, were followed between 2007 and 2011. Team medical staffs recorded individual player exposure and time-loss injuries. Radiological grading was performed using a modified Peetrons classification into four grades where grades 2 and 3 represent fibre disruption. Results In total, 516 hamstring injuries occurred and 58% of these were examined by MRI. Thirteen per cent were grade 0 injuries, 57% grade 1, 27% of grade 2 and 3% of grade 3. Grade 0 and 1 injuries accounted for 56% (2141/3830 days) of the total lay-off. The lay-off time differed between all four radiological grades of injury (8±3, 17±10, 22±11 and 73±60 days, p<0.0001). Eighty-three per cent of injuries affected the biceps femoris while 11% and 5% occurred to the semimembranosus and semitendinosus, respectively. Re-injuries (N=34/207) constituted 16% of injuries. All re-injuries occurred to the biceps femoris. Conclusion MRI can be helpful in verifying the diagnosis of a hamstring injury and to prognosticate lay-off time. Radiological grading is associated with lay-off times after injury. Seventy per cent of hamstring injuries seen in professional football are of radiological grade 0 or 1, meaning no signs of fibre disruption on MRI, but still cause the majority of absence days. The main objective of this prospective study was to evaluate the use of MRI as a prognostic tool for lay-off time after hamstring injuries on professional football players. A further aim was to investigate the use of MRI in hamstring injuries in elite level football teams and to study the association between MRI findings and injury circumstances. Our hypothesis was that the grading of injuries using MRI is associated with lay-off time from football. A prospective cohort study of men's professional football in Europe has been carried out since 2001, the Union of European Football Associations (UEFA) Champions League (UCL) study.3 For the purpose of this substudy, 23 European professional teams (816 players) were followed over two to four seasons between July 2007 and April 2011. All contracted players in the first teams were invited to participate in the study. The full methodology and the validation of the study design are reported elsewhere.25 The study design followed the consensus on definitions and data collection procedures in studies of football injuries.25 26 An overview of the general definitions is seen in table 1. Specifically for this study, a hamstring injury was defined as ‘a traumatic distraction or overuse injury to the hamstring muscle leading to a player being unable to fully participate in training or match play’.4 Structural disorders such as total and partial muscle ruptures, as well as functional disorders such as fatigue-induced, spine-related or neuromuscular muscle disorders were included while contusions, haematomas, tendon ruptures and chronic tendinopathies were excluded. Player baseline data were collected once yearly at the start of the season. Individual player exposure in training and matches was registered by the clubs on a standard exposure form to be sent to the study group on a monthly basis. The team medical staffs recorded injuries on a standard injury form that was sent to the study group each month. The injury form provided information about the diagnosis, nature and circumstances of injury occurrence. All injuries resulting in a player being unable to fully participate in training or match play (ie, time-loss injuries) were recorded, and the player was considered injured until the team medical staff allowed full participation in training and availability for match selection. All injuries were followed until the final day of rehabilitation. From the 23 teams involved in the UCL study, 15 (65%) agreed to participate in a discussion about MRI of thigh muscle injuries. A questionnaire was sent to these clubs in February 2007, and agreement was reached concerning the use of MRI for inclusion in this study. For the purpose of this study, the clubs were instructed to perform the initial MRI examination within 24–48 h of the injury event. The MRI machine should not be older than 5 years and have a field strength of at least 1.5 T. The minimum MR sequences should include axial and coronal planes using T1, T2 with fat saturation, and/or Short Tau Inversion Recovery (STIR) sequences. An MRI Thigh Injury Report Form was created with information about date of imaging, name of radiologist evaluating the images, MR sequences used, muscles involved and severity of injury. If more than one muscle was injured, the muscle with the most extensive pathology was denoted as the primary muscle involved, and assessment criteria were taken for that particular muscle. For severity classification, a modification of Peetrons classification27 was used with the following grading system: grade 0 negative MRI without any visible pathology, grade 1 oedema but no architectural distortion, grade 2 architectural disruption indicating partial tear and grade 3 total muscle or tendon rupture. All radiologists used the same standard evaluation protocol. Nine of the teams used PACSMail (www.sybermedica.com) to send their MRIs for online review by two independent radiologists (J.H. and J.L) who were unaware of clinical details other than the suggested hamstring injury. Copies of scans and associated reports from the nine teams using PACSMail were then sent electronically to the UEFA injury surveillance study group. The other six teams had the paper-based MRI forms filled in by the consultant radiologist for the club and these were sent to the study group by mail. Analysis of variance with Bonferroni post hoc test was used for between-group comparisons of lay-off time. Association between categorical variables was measured with Pearson's χ2 test or Fisher's exact test. Bonferroni correction was used for multiple pairwise comparisons. The significance level was set at p<0.05. All statistical analyses were made in IBM SPSS Statistics 19.0. The study design underwent an ethical review and was approved by the UEFA Football Development Division and the Medical Committee. Of the 516 hamstring injuries recorded during the study period, 299 (58%) were examined by MRI and 118 (40%) of these also had concomitant initial US. One hundred and fifty-two injuries (29%) were examined by initial US only without MRI, and 65 (13%) were examined clinically without the use of any imaging. MRI forms for 207 of the 299 MRI examinations (69%) were received (figure 1); 140 MRIs (68%) from nine clubs were examined by the two independent radiologists while 67 MRIs (32%) were examined by radiologists from six different clubs. 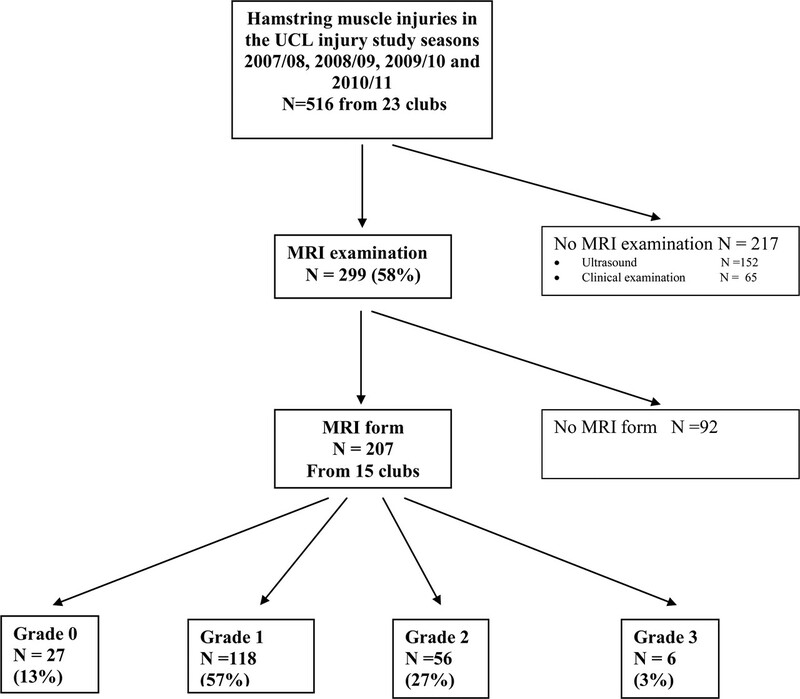 Only 207 hamstring injuries with completed MRI forms are included in the following results. Flowchart of hamstring muscle injuries in the UEFA Champions League injury study seasons 2007/08, 2008/09, 2009/10 and 2010/11. Twenty-seven of the 207 (13%) injuries were radiological grade 0, 118 (57%) were of grade 1, 56 (27%) of grade 2 and 6 (3%) were of grade 3 (figure 1). Grade 0 injuries accounted for 5% (207 days) of total absence (3830 days) due to hamstring injuries, compared with 51% (1934 days), 33% (1250 days) and 11% (439 days) for grades 1, 2 and 3, respectively. The lay-off time from football differed significantly between the four grades of injury (8±3, 17±10, 22±11 and 73±60 days for grades 0, 1, 2 and 3 respectively, p<0.001). When performing pairwise comparisons, the differences were significant between all pairs except between grades 1 and 2 (p=0.053). However, the figures for grade 3 are less robust since it is a small group with a large variation of absence days. As seen in table 2, there was a clear association between radiological grades and clinical severity as measured by the absence days from training sessions and match-play. From the 180 injuries with some muscle pathology visible on MRI (grades 1–3), 151 (84%) affected the biceps femoris (BF) muscle while 20 (11%) and 9 (5%) occurred to the semimembranosus (SM) and semitendinosus (ST) muscles. There was no significant difference in lay-off time for injuries to the three different muscles (BF 21±19, SM 19±11 and ST 17±11 days, respectively, p=0.79) nor was there any difference concerning distribution in radiological grading (p=0.46). Seventy per cent (117/167, information missing for 40 of the 207 injuries) of the hamstring injuries occurred during sprinting or high-speed running. The proportion of running/sprinting injuries was similar among the different radiological grades (p=0.44). Other mechanisms were overuse and stretching/sliding (each 5%), shooting and twisting/turning (each 4%), passing and jumping (each 2%). When categorising injuries as traumatic or overuse, the latter ones dominated among grade 0 injuries (69%) compared with 31%, 30% and 36% in grades 1–3 (p<0.001, p=0.001 and p=0.102, respectively). Almost all muscle injuries were non-contact in nature (95%). Fifty-five per cent of the hamstring injuries affected the preferred kicking leg (BF 51%, SM 67% and ST 50%, p=0.68). There was no difference in lay-off time between injuries to the kicking leg compared with the supporting leg (17±14 vs 22±25 days, p=0.13). Re-injuries constituted 16% (34/207) of all hamstring injuries with no significant difference in rates between different radiological grades (p=0.35) (table 2). All 30 re-injuries with pathology on MRI (grades 1–3) occurred to the biceps femoris and none of them to the semimembranosus or semitendinous muscles. There was no significant difference in lay-off times between index injuries and re-injuries (18±18 vs 18±11 days, p=0.98). None of the six grade 3 injuries were re-injuries. A main finding in this study was that 70% of hamstring injuries seen in professional football show no signs of fibre disruption on MRI. Still, these mild injuries represent more than half of the lay-off due to injury. Another important finding was that radiological grading was closely associated with lay-off times and might be useful to prognosticate absence. Two of three hamstring injuries were grade 0 or 1 injuries, showing no signs of muscle fibre disruption on MRI. Still, these injuries caused more than half of the absence days. This means that from a club's perspective, these injuries represent a significant problem due to their high incidence, even if most hamstring injuries have a favourable prognosis and are effectively handled conservatively.24 Surgical repair is normally reserved for total ruptures, such as avulsion injuries, but these injuries are rarely seen in football, representing only a few per cent of all hamstring injuries as shown in this study. The ability to predict lay-off is very important for the injured player as well as the coaching staff.18 Another main finding of this study is therefore that radiological grades are highly associated with lay-off time from football. It seems logical that radiological severity is correlated to clinical severity, thus indicating that an MRI examination done 24–48 h after a hamstring injury could provide information about what absence to be expected. Several studies from Australian Rules football16,–,19 21,–,23 have shown the possibility to use MRI to prognosticate lay-off time after hamstring injury. Schneider-Kolsky et al19 compared MRI (with radiologists blinded to clinical data) and clinical assessment of acute hamstring injuries and found both methods to be useful as a predictor for the duration of rehabilitation required. However, muscle injuries are a heterogeneous group and the need for classification and subgrouping of muscle injuries have been emphasised.4 10 Ekstrand et al4 have recently shown that more than 90% of all muscle injuries in male elite footballers affect four muscle groups (hamstrings, quadriceps, adductors and calf muscles), but injuries to different muscle groups behave differently. If the aim is to prognosticate absence due to injuries, a further subgrouping into severity grades is necessary since the absence differs significantly between different radiological grades. As suggested by Gibbs et al18 in their studies of hamstring injuries in Australian Rules football, further subgrouping into injury type, intramuscular location and dimension of pathology might be of additional value in prognosticating absence. In this ongoing study, these qualities are measured, but (due to the necessity of subgrouping into muscle groups and grades) the numbers of each subgroup are still small and further data are needed for safer statements. In our 180 injuries with pathology on MRI, we found that 84% affected the BF, 11% the SM and 5% the ST. Our findings are consistent with previous studies by Koulouris et al,16 who analysed MRIs of 31 hamstring injuries in Australian football players and found 84% injuries to the BF, 10% to the SM and 6% to the ST. In accordance with the findings of Slavotinek et al21 in Australian Rules football, we found no relation between the specific muscle involved and lay-off time. ▶ Hamstring injury is the most common injury in professional football. ▶ Most of the hamstring injuries occur to biceps femoris. ▶ MRI can be helpful in verifying the diagnosis of a hamstring injury and also to prognosticate lay-off time. ▶ Radiological grading is associated with lay-off times after injury. ▶ Seventy per cent of hamstring injuries seen in professional football show no signs of fibre disruption on MRI, but still cause the majority of absence days. As a conclusion, this study shows that MRI can be helpful in verifying the diagnosis of a hamstring injury and also to prognosticate lay-off time. Radiological grading is associated with lay-off times after injury. Seventy per cent of hamstring injuries seen in professional football show no signs of fibre disruption on MRI (radiological grade 0 or 1 injuries), but still cause the majority of absence days. The authors wish to thank the participating clubs, medical staffs and players. A special thanks to the contact persons in clubs that have sent us MRIs by PACSMail: Edwin Goedhart (AFC Ajax), Markus Braun (BV Borussia Dortmund), David Wales (Arsenal FC), Alex Nieper (Chelsea FC), Francesco Benazzo, Franco Combi and Giorgio Panico, (FC Internazionale Milano), Nelson Puga (FC Porto), Cees-Rein van den Hoogenband and Luc van Agt (PSV Eindhoven), Paco Biosca and Viktor Kirilenko (Shakhtar Donetsk). The statistical advice of Henrik Magnusson (Msc) is also gratefully acknowledged.
. Soccer injuries in Iceland. Scand J Med Sci Sports 1996;6:40–5.
. Risk of injury in elite football played on artificial turf versus natural grass: a prospective two-cohort study. Br J Sports Med 2006;40:975–80.
. Injury incidence and distribution in elite football–a prospective study of the Danish and the Swedish top divisions. Scand J Med Sci Sports 2005;15:21–8.
. Injuries among male and female elite football players. Scand J Med Sci Sports 2009;19:819–27.
. Soccer injuries. I: Incidence and severity. Sports Med 1994;18:55–73.
. Football injuries during FIFA tournaments and the Olympic games, 1998–2001: development and implementation of an injury-reporting system. Am J Sports Med 2004;32:80S–9S.
. Muskelverletzungen im sport. Stuttgart Georg Thieme Verlag KG 2010.
. UEFA Champions League study: a prospective study of injuries in professional football during the 2001–2002 season. Br J Sports Med 2005;39:542–6.
. Injuries in Swedish elite football—a prospective study on injury definitions, risk for injury and injury pattern during 2001. Scand J Med Sci Sports 2005;15:118–25.
. Muscle strains in soccer: a five-year survey of an Italian major league team. Knee Surg Sports Traumatol Arthrosc 2004;12:482–5.
. The Football Association Medical Research Programme: an audit of injuries in professional football—analysis of hamstring injuries. Br J Sports Med 2004;38:36–41.
. Muscle injury: the role of imaging in prognostic assignment and monitoring of muscle repair. Semin Musculoskelet Radiol 2010;14:194–200.
. Clinical risk factors for hamstring muscle strain injury: a prospective study with correlation of injury by magnetic resonance imaging. Br J Sports Med 2001;35:435–9; discussion 440.
. Imaging of hamstring injuries: therapeutic implications. Eur Radiol 2006;16:1478–87.
. Ultrasound of muscles. Eur Radiol 2002;12:35–43.
. Ultrasound and magnetic resonance imaging in sports-related muscle injuries. Radiol Med 2006;111:836–45.
. Assessment of player performance following return to sport after hamstring muscle strain injury. J Sci Med Sport 2006;9:87–90.
. Muscle strain injuries: clinical and basic aspects. Med Sci Sports Exerc 1990;22:436–43.
. Hamstring injuries in sprinters. The role of concentric and eccentric hamstring muscle strength and flexibility. Am J Sports Med 1994;22:262–6.
. A prospective epidemiological study of injuries in four English professional football clubs. Br J Sports Med 1999;33:196–203.
. Does fatigue induced by repeated dynamic efforts affect hamstring muscle function? Med Sci Sports Exerc 2000;32:647–53. Garrett WE Jr. Muscle strain injuries. Am J Sports Med 1996;24:S2–8. Funding UEFA, Swedish Centre for Research in sport and Praktikertjänst AB. Ethics approval UEFA Football Division and UEFA Medical Committee.